It's one thing to tow a boat a few miles, or even through a few counties. Going state to state is a bigger undertaking, but when you start crossing deserts, you're trailering on a whole new level. 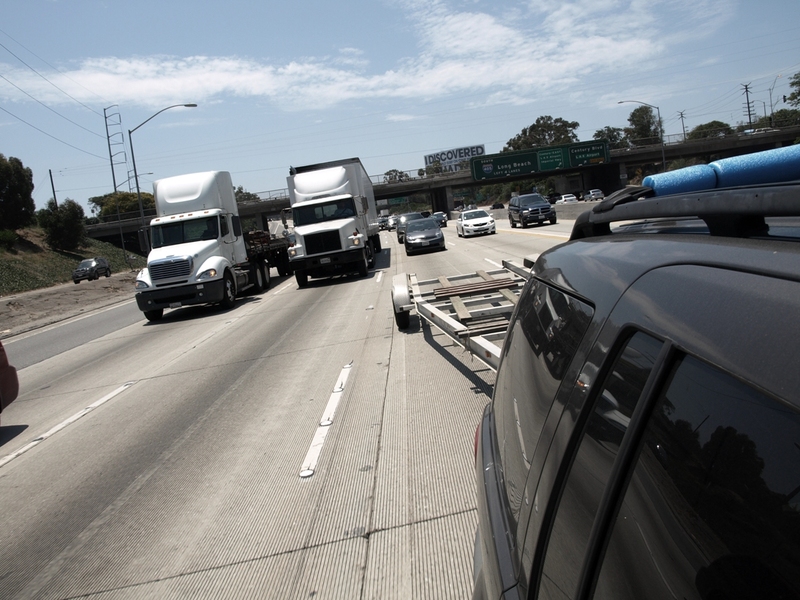 In my post "Tips on Trailering", we looked at many dynamics that affect any towing effort. This time around we're going to look at boat towing on a larger scale. When you travel cross-country you are a ship at sea - gotta be able to fix and maintain things along the way. Gotta be self sufficient. also find yourself at someone else's mercy. Looking back at the history of ancient mariners, we read accounts of sailors spending as much as a year somewhere to rebuild their ship. and they'd stay as long as it took to repair their ship. and farmers - just to survive such an adventure. There was no Triple A. If you broke a mast, you'd have to find the right tree, chop it down, do all the things required to put the new lumber in place, and then hope it worked. That was a long time ago, but some of the basic principles are the same. Back in my yacht charter days, I remember hearing stories from friends who had crewed on large vessels making their way from the East Coast to the West Coast, by way of the Caribbean and through the Panama Canal. I can tell you that some things haven't changed much. their sextants for GPS systems, but when you're out there, you're out there. and some of them even have badges. and previously managed the one in Irving, Texas. from his recent trip between the two locaitons towing a gondola. but what I'm referring to here is the equipment. Get a clean bill of health on that trailer - actually take it to a pro and have them inspect and/or replace the bearings. if you think they'll make the journey without incendent. 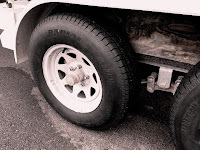 Trailer tires often sit for a long time with little use - this is great news if you're hoping to save the tread. The concern though, is the overall condition of the rubber. Leave a trailer in the Nevada sun for a couple of years and you'll end up with rubber that crumbles easily. Matt had all four tires replaced for this recent trek and it contributed greatly to to both his safety and his peace of mind. Make sure the tongue of that trailer will clamp effectively to the ball. I speak from experience when I tell you that if the trailer should happen to come loose from the hitch on the freeway, things tend to get really exciting. A clean bill of health also applies to the towing vehicle. Fluids, lube, brakes, and you just might want to make sure the air conditioning works. This is something you don't want to hear from an officer with a ticket book. So update your tags - license plate registration tags, that is. If your trailer requires annual "tagging", update it too. Expired tags are among the things that law enforcement officers routinely look for. It's a great excuse to pull you over. "proof of insurance" piece of paper. and makes you look like you don't have your act together. It happened to me once and I'll never let it happen again. can become very "big things" if not tended to ahead of time. Also make sure the boat is insured for the trip. It wouldn't be nice to have your boat fall off the trailer or get run into by another motorist, but if it happened, wouldn't it be nice to know that the boat was insured for such a thing? They say every journey begins with a single step, and while that may be true, your journey should begin before you ever hook the vehicle up to the trailer. It should start at your desk and on your phone. It should be planned and mulled over, you should know as much as you can about the territory ahead. Boat placement is very important. Matt Schenk was driving: somewhere in New Mexico when I got him on the phone. It was the middle of the night. As we talked about all the prep he spouted off a few thoughts. 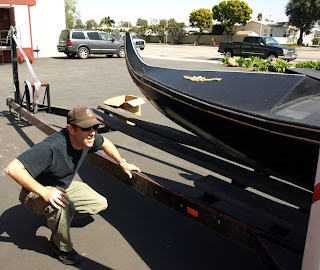 "make sure you get the boat placed right on the trailer. Too far forward or too far back and it could have a detrimental effect on things when you go to take a turn somewhere." Also remember that the way the boat sits on the trailer can affect the way your towing vehicle makes (or doesn't make) contact with the road too. There have been rare cases where someone had to slam the brakes on and then turn the wheel - only when they slammed on the brakes, the weight of the boat rocked forward, pressing down on the back of the vehicle. Guess where the front wheels were when the driver went to turn them...mhmm, they were off the ground. Popping a wheelie isn't always a good thing. 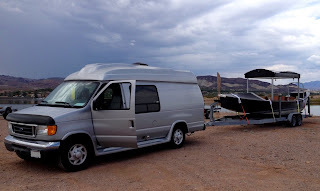 for a cross-town trip, you can sometimes get away with leaving things like cushions and canopies in place, but when covering long distances, you're better off taking everything off the boat that you can. At high speeds, wind tears canvas, hatches take flight, and you end up repairing or replacing things - custom made things. Also, if the wrong item flies off at the wrong time, you may end up replacing someone elses windshield. It seems like every time I drive the freeway I spot a couch cushion that someone was sure would stay in place. They were wrong, and I'm sure they were angry (or had a wife who was angry) about the mysterious disappearance of a cushion. If you want to keep those removable boat parts, remove them before the wind does it for you. but for a long voyage I like to use four or more. I place all the buckles on the left (or port side) of the boat - so I can see them all in my left rear-view mirror. Four straps, all with buckles on the left. Well placed zip ties can keep the hooked ends in place even if something gets loose. If a strap snaps, it doesn't end up on the hood of the car behind you. Also, you want to be able to repair and re-attach it, rather than go buy another one. A little buffing material at edges and rails can go a long way toward preserving the finish of the boat - rags work, cut up t-shirt material is great, but my favorite is old socks. Cut the toes out of some old cotton socks, run the straps through them, and place them over rails, bow crests, and any other place that a bare strap might rub against. Lose your straps, and you might just look back and see this! (and may already have since the last time you serviced it) should be checked. it's easy for nuts and bolts to vibrate and come undone. Next thing you know, you're looking in your rear view mirror, spotting a piece of the boat hanging by one last fastener, and praying you can get the whole rig pulled over before it frisbees off the boat and onto the road. So how do you keep things from unscrewing? Locking nuts are great, but if you don't have them in place, another solution is to fill the threads above each bolt so the nut can't spin past it. There's a product called Plasti-dip that works well for this application - it's intended for use in re-coating the grips of hand tools, but you can paint it onto the threads of a bolt quite easily. Thick paint, super glue, or even Liquid paper can sometimes also do the trick. 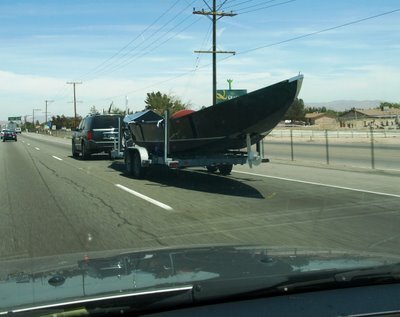 Towing a boat on the highway can be a real test of your brain, vision, hearing, and especially your nerve. It requires great focus, especially if you're sharing the road with lots of other vehicles - vehicles that may be moving a lot faster than you are. You need to get in the zone, adjust the way you see and process the road ahead. In some ways it helps to relax, but still try to stay hyper focused. the same is true for the pavement behind you. Remember that many of your fellow drivers are moving faster than you are. Matt says "Don't just focus on whats ahead, when you're towing something big and moving at the speed you should be moving at, you need to watch whats going on behind you. People are passing you all the time, cars and trucks will come up behind you. If someone's right on your tail, it's good to know that before you hit your brakes. " but what's coming up faster than you. it won't be your fault. 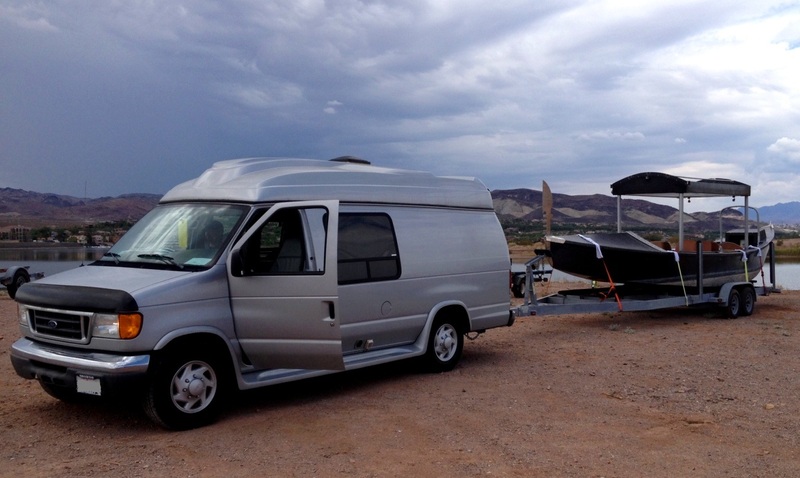 do you want to incur the damage to your boat, trailer, and vehicle? No matter who is at fault, a fender bender can be disastrous. What might seem to be minor damage to the trailer, can translate to a major problem if it keeps you from getting where you need to go. you'll want to leave some extra space in front of you. Jerks will use that space, cutting in front of you; they may even wave a finger. I guarantee you, that if you spend enough time on the highway pulling a trailer, you'll gain a new level of respect for truck drivers. As you come off the highway, you'll want to remember that extra stopping room. You'll need to ask yourself "what if" questions all along the way. you may need to make a split second decision as to whether to run the red light or slam the brakes. Sometimes being annoyingly cautious is the name of the game. Beware of the small-town cop. I have a great respect for the men in blue, and most of them exemplify what's good about our country, but there are a few exceptions out there. One occasional example is the small town speed trap. and carry through with velocity as you enter city limits. In certain parts of the country, you may encounter a sudden decrease in the speed limit as the road approaches a town. There's a good chance that you'll see a police car just beyond that new speed limit sign. I've heard that some of these small towns cover most of their expenses through the "revenue" of speeding tickets. You know, I could be wrong on this one. It could be that I've just been given some bad information, but all the same, if there's a posted speed limit, it's still our duty to follow the law. but a GPS will do some of the thinking for you. Bring your favorite music. All of it. Bring that Jimmy Buffet boxed set. Bring some of the old cassettes you recorded off the radio back in middle school. Bring a few books-on-tape (or their digital equivalents). Just like in some game shows, having the right person on the other end of the phone can mean the difference between success and failure. It's good to be able to get someone on the phone who's more knowledgeable in some areas (like towing, trailering, or the territory ahead), but the most important life-line is that person who you can call and talk to when you're just ten miles from a stopping point and can't stay awake. to the next place that you can sleep. Talk about sports, politics, heck - get in an argument if it keeps your eyes open. On more than one occasion, Matt has brought a list of people to call: old friends, clients, family members, ex girlfriends, even his boss (me). During his recent towing trip from Las Vegas to Irving, Texas, Matt called me one night as he was fighting off drowsiness. I added a little edge to the conversation, made it a bit more annoying, joked with him about how I was purposefully messing with him to keep him awake. He was annoyed, but he got to his rest stop safely. After a great night's sleep, Matt called me and thanked me for keeping him awake the night before. "I get by with a little help from my friends". 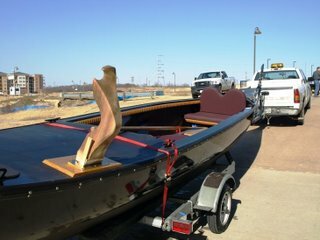 I won't claim to be an expert on the subject of trailering gondolas, but I have done it a lot. I will tell you that just about every time I pull a boat down the highway, I learn something new, or am reminded of something I should have remembered from before. Something I like about the gondola world is that most of the people in it enjoy talking to each other, and aren't afraid to share information like this. If you've got some tips of your own, I'd love to hear them, and share them here, so we can all "get by with a little help from our friends".